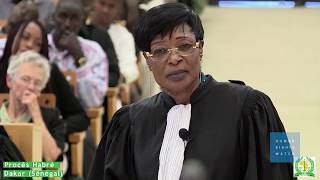 (New York, December 6, 2017) – Human Rights Watch today released a new video "The Trial of Hissène Habré," about the trial in Senegal of the former Chadian dictator. The video is being released as Habré's victims step up their campaign to receive the reparations they have been awarded. Habré was convicted on May 30, 2016, of crimes against humanity, war crimes, and torture, including sexual violence, by the Extraordinary African Chambers (EAC) in Senegal and sentenced to life in prison. On April 27, 2017, the EAC appeals court confirmed the verdict and ordered Habré to pay approximately US$150 million in victim compensation. "It took 25 years of relentless campaigning by Hissène Habré's victims before he was finally brought to trial," said Reed Brody, counsel at Human Rights Watch who has worked with the survivors since 1999. "Habré's victims should not have to wait any longer to be compensated for the suffering they endured."